I get this assumption all the time from people and often from some PR's. "Oh you can just snap a few photos and write some words and have the post up today, can't you?" No. I generally take one day as my 'blogging day' and snap some blog posts and instagram photos, this takes me hours. Editing the photos takes another hour and then you have to write, publish and promote those posts. It really isn't as easy as some people assume! It took me about a year before I was even offered a product, so if you're thinking of starting a blog purely to be sent products, maybe think of a new idea. You have to put effort into your blog for people to think "I'd like this person to promote our product." While I follow a lot of the 'bigger' bloggers and youtubers on snapchat and it seems they get sent lorries of makeup and products every day, for most it isn't like this. Especially me, I'm quite picky about what I accept as I always think "could I write a good, lengthy, detailed post on this?" While from snapchat/instagram/twitter these look super fun and look like everyone knows everyone, they're actually TERRIFYING. Am I going to get murdered by a serial killer who has lured me to this skincare event? As an introvert I am terrified of events, I've been to two in my whole time blogging. I wish I was more confident to go to more, I'm just very awkward with people I don't know and fear being the odd one out! I don't want this post to be me moaning constantly! 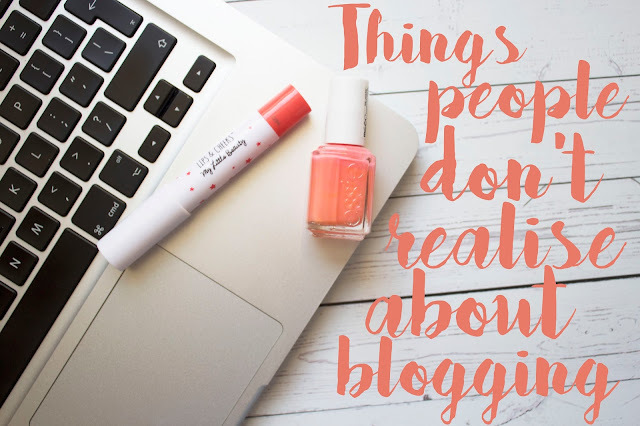 Blogging is great, there are negative sides to it, yes. However surely there is with anything? On the whole, I love what I do. I used to keep hush, terrified someone would made fun of me and yes, some people have, but on the other hand my family and friends are SO ridiculously supportive and I've met some fabulous people through it. Built up my confidence, improved my writing and photography, got a fun hobby and got something extra to add to my CV!